Tyngsborough Town Hall is located at 25 Bryants Lane, Tyngsborough, MA 01879; phone: 978-649-2300. Photo: Old Town Hall, Tyngsborough Massachusetts. Listed on the National Register of Historic Places in 2004. Photographed by User: John Phelan (own work), 2010, [cc-by-3.0 (creativecommons.org/licenses/by/3.0)], via Wikimedia Commons, accessed January, 2013. Before the coming of the European settlers, generations of Native Americans frequented the Merrimack River. They foraged, hunted, and lived in what is now Tyngsborough. Passaconaway was a great chief of the Pawtuckets and the Pennacooks, who lived much of the time at Wiscasee (now Tyngs Island), his favorite planting ground and encampment. Here corn was safe from bear and deer and the Wiscasee Falls, now flooded by the dam at Pawtucket Falls in Lowell, provided fish in great abundance. By 1644, Passaconaway signed an agreement placing his tribes under the authority of the colonial government. Meanwhile, Edward Tyng, from Dunstable, England, had settled in Boston by 1638. He lived on the corner of State Street and Merchant's Row, where he owned a house, a brewery, and a warehouse with a wharf. Settlers in Boston, Charlestown, and Concord had begun looking for land in the wilderness to accommodate their growing numbers. The government made land grants in the unsettled areas west of Concord to wealthy families who advanced funds to pay for public works. Many of the families that figured prominently in the history of the region were recipients of these grants. Edward Tyng, still a resident of Boston, bought 3,000 acres on the west side of the Merrimack in 1660 in what is now Tyngsborough. So many of the Proprietors of the town of "Old Dunstable," including present day Tyngsborough, were from more settled areas that some of the first town meetings were held in Woburn or other towns further to the east. In 1668, Tyng deeded his holdings on the Merrimack to his son Jonathan, who built a house and began working his land. The period from the mid-1600s to the late-1700s was filled with fur trading, land clearing, farming, mill building, road construction and occasional hostilities with the Indians. Wannalancet, a son of Passaconaway, and his band remained friendly during the early part of this period and continued to live at Wiscasee Island or wander further to the north. There were bloody battles with other bands. In 1674 Dunstable Road was laid out. In 1760 the county ordered that two roads be built, one on each side of the river, connected by a ferry. There was also a ford-way that crossed the river on the bend, near Smoking Rock. A tavern at this river crossing was reputed to be a busy place. When the dam a Pawtucket Falls was built it was no longer possible to ford the river. Many of Tyngsborough's men participated in the events leading up to the Declaration of Independence and fought in the Revolutionary War. By 1790, Tyngsborough had 382 inhabitants. Sarah Winslow, a daughter of Eleazer Tyng, set up a trust with Harvard College in 1789 to benefit the town. It helped fund the construction of the Winslow School and still provides annual income to the town. A condition of her bequest was that the district, then part of Dunstable, be known as Tyngsborough to honor her father and his family. 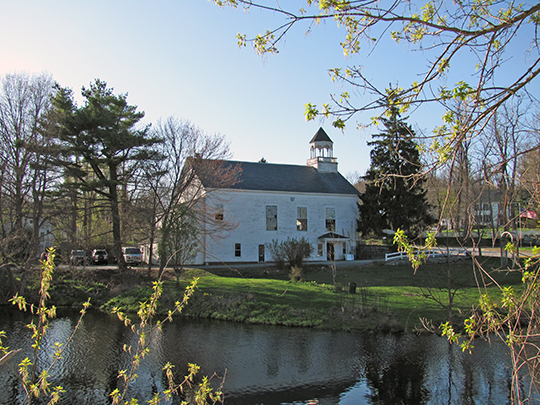 A gristmill and sawmill were operated at Massapoag Pond as early as 1787 and several other mills were located on streams in other parts of town. By the 1790s Lowell was becoming a manufacturing center and by 1800 Tyngsborough was a thriving town. It had three stores, a tavern, a tailor, a carpenter, a cooper, a wheelwright, a hatter, a harness maker, a saddler, two shoemakers, a blacksmith, a gristmill, a carding mill, two sawmills, a tan house, a currier's shop, and a whip shop. The Middlesex Canal was opened in 1804 and finally completed in 1811. It connected Lowell's factories to the port at Boston. Granite quarried in Tyngsborough was floated down the river and used to build some of the Pawtucket Dam in Lowell. Granite from Tyngsborough was also floated down the canal and used to build the Charlestown Prison and used for the columns for the Boston Custom House. River traffic became more and more important. In 1812 the Merrimack Boating Company was formed and ran between Concord, New Hampshire and Lowell. River cargo boats were a common sight. At first, wind and men with poles powered them up and down the river, but after 1815, they were towed by steamboats. Crossing the river was still by ferry. Regular ferry service began in 1729. By 1809 the county operated a chain ferry near the location of the present bridge. After decades of relying on ferrying across the river, an iron bridge was finally completed across the river in 1873. Tyngsborough took advantage of its proximity to Nashua and Lowell and began providing these manufacturing centers with needed boxes and barrels for shipping the products produced at these industrial centers. In 1835 the Boston and Lowell Railroad began operations, linking Tyngsborough to its neighbors and markets. By 1849 a box factory was located at the center of town near the outflow of Flint Pond at the site of an earlier sawmill and wheelwright's shop. In 1875 Flint Pond was dammed to provide additional waterpower for the box shop. Eventually this box mill sent boxes to factories all over the eastern states. Electric trolleys began service between Lowell and Tyngsborough in 1897. Lakeview Avenue, between Lake Mascuppic and Frost Road was built as a trolley line in 1895. Trolley service ceased in 1930. Before the turn of the century, Tyngsborough became a popular recreation site boasting several pleasure grounds and resorts. River steamers, trains, trolleys, and autos brought visitors to Harmony Grove on the river, Willowdale on Lake Mascuppic, Mount Rock, on the western shore of Lake Mascuppic, and a variety of other resorts and spas where they enjoyed lakeside bowling, boat rentals and picnics. In 1895 the town's population was 652 people and by 1905 the summer population was double that number. Many of these resorts catered to vacationers from Boston and New York. Summer camps and bungalows surrounded the town's lakes and the Merrimack River. The original iron bridge was replaced with the existing Tyngsborough Bridge in 1930 and became the town's most striking landmark. Automobiles soon became the main mode of transportation as trolleys, river steamers, and finally trains were abandoned. In 1959 Middlesex Road was widened as a temporary measure to accommodate increased traffic until the New Route 3 was completed in 1961. Passenger train service finally ended in 1970. Tyngsborough Master Plan Committee by Brian K. Barber, City and Town Planning Consultant In Association with Daphne Politis, Optimal Solutions and Bill Giezentanner, Giezentanner Associates, Master Plan for Tyngsborough Massachusetts, ca. 2004, http://www.tyngsboroughma.gov, accessed January, 2013.